Aspirational sports movies tend to have additional cachet when they are based on true stories (The Blind Side). If you can also incorporate an always-popular fish-out-of-water element, so much the better (Cool Runnings). Thomas McCarthy’s screenplay for Million Dollar Arm chronicles how two Indian baseball pitchers were brought to the major leagues (albeit omitting that their success hasn’t been of legendary proportions), but is much more interested in the guy who found them. The result is an overlong feature that hits agreeable notes during its first half, before succumbing to listless montages and forced drama to pad out its running time. Baseball movies tend to be the most reliable ones in the sport genre. It’s a genre where the formula of the game, or trying and winning, or losing with dignity, is built into storytelling structure. As such, it’s difficult to strike new ground here, and easy to succumb to predictability. The best one can usually hope for is that a familiar ride is reliably fashioned. 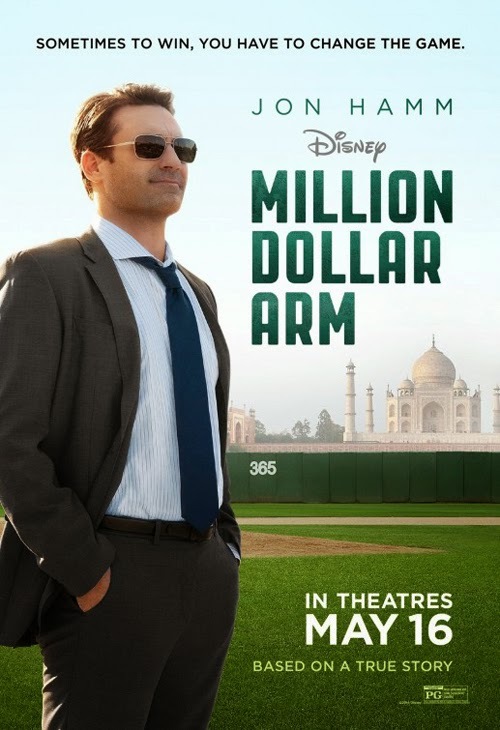 The kernel of Million Dollar Arm finds sports agent J.B. Bernstein (Jon Hamm, a down-at-heel Don Draper) struggling to go it alone (“No, I don’t want to work at the Death Star. I hate the Death Star” his partner Aasif Mandvi comments of the prospect of returning to one of the big agencies). He hits upon the idea (during a channel-hopping mix tape of Susan Boyle and a test match) of inviting Indian bowlers to try their arms at baseball, setting up the search as a talent contest (the Million Dollar Arm of the title). There’s the publicity value, of course, but mainly it’s about the not-inconsiderable sweetener for investors of the profits to be tapped from the Indian market, if there are actual players for the cricket-loving populace to get behind. Inevitably, the movie concentrates on the white guy who found the players rather than the players themselves. Perhaps also inevitably (this being Hollywood) the moviemakers (I’m not necessarily suggesting McCarthy put this in his screenplay) indulge in some lazy cultural stereotyping (the two pitchers are all at sea with magical inventions such as escalators and elevators). Hamm deserves some credit, though, for taking a less-than-noble big screen lead role and playing grouchy and self-centred for much of the proceedings. All Bernstein is interested in is the deal, until he inevitably has his perspective corrected. This encompasses a rather contrived romance with his tenant (Lake Bell; the end titles suggest this element is factual, but their skyping across continents is no less phoney for that) and standing up to the moneyman (Tzi Ma). While Bernstein’s unreconstituted demeanour is refreshing at first, it’s the only part that is. Million Dollar Arm is likeable, but it manages to be determinedly pedestrian. Craig Gillespie, who, judging by his filmography, is the epitome of a journeyman (his last cinematic outing was Fright Night), only manages to snap into a much-needed rhythm during the first leg. The scenes in India, playing off Bernstein’s culture shock, the excitement of the trials, and the irresistible Alan Arkin’s grumpy talent scout, are well paced and enjoyable. Pitobash’s over-excitable guide Amit provides added comic relief. However, while Suraj Sharma (as the javelin throwing Rinku) and Madhur Mittal (as the runner Dinesh; neither of them turn out to be cricketers, undermining Bernstein’s bowler/pitcher theory) are winning performers, they have the most perfunctory of character beats (homesickness, existing to react to Bernstein’s mistreatment). The second half of the movie, as Bernstein pursues a big value client and reluctantly allows the players to live with him yet neglects their well-being, runs out of steam. Gillespie goes through the motions with such elements as the party scene (comedy vomiting! ), the dashing of dreams, and the second chance/mending of ways. There’s even a toe curling (it’s supposed to be heart-warming, I know) “welcome to India” sequence, in which J.B.’s back garden is turned into an exotic restaurant. Bill Paxton also makes a showing (not one of his memorable) as the idiosyncratic trainer who knows how to treat the lads as human beings, in contrast to grumpy J B. As I said, it’s the clichés, more than in any other genre, that underpin sports movies. It doesn’t take too much to make a passable one, as long as the basic structure is in place, but it’s contrastingly much more difficult to make a great one. Tom McCarthy has written and directed several fine films (The Station Agent, The Visitor), and his next (Spotlight) sounds promising, yet he comes a bit unstuck here. In the end it’s only A R Rahman’s lively soundtrack that keeps Million Dollar Arm swinging.